Being an independent do-it-yourselfer was never an option for me, it was a requirement. Although I have a history of developing horses from the ground up, am 100% responsible for our horse’s hoof care, as well as a self-published best-selling author and the driving force behind BarrelRacingTips.com, becoming a successful barrel racer is NOT something I have done alone. It takes a village, and the leader of mine is our Lord & Savior. He is the source of my unending motivation, and the inspiration behind everything I do. 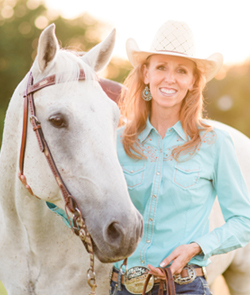 The purpose of my life is very clear – to serve God through my mission to help barrel racers WIN, IN the arena and out. One of His greatest gifts has been my loving husband, Craig Smith. As a USTRC Reserve World Champion team roper, a passion for horses and competing is one we share. I am beyond blessed to spend my my days riding by his side. I wouldn’t be where I am today without the many horses that have contributed to my growth and success over the years. Our current standouts include Marked and Honored (Pistol), Zans Bar Chex (Dot Com) and Lowrys Soda (Frosty). Their incredibly varying range of personalities and innate characteristics combined with the ongoing challenge of optimizing and revealing their greatest potential is something I thoroughly enjoy. As a equine educator, I’m grateful for the opportunity to learn from such talented athletes and willing students. Below I’ve shared some of the products, services and people my husband and I (and our horses) depend on. Our drive to be the best has enabled us to quickly identify those that align with our program. I am a practical person who values simplicity and prefers quality over quantity. While never-ending personal development AND staying current on the latest research and technology is important to me, I don’t do fads. I resonate with others who live and work by the same guiding principles of authenticity, honesty, and integrity. You can be assured that your life AND your horse’s performance will be positively impacted as ours have through offerings from the fine folks and companies listed below. After my barrel horse reinjured a ligament in 2015, I knew a complete and lasting recovery would mean incorporating EquiVibe therapy into his routine for rehab, performance and preventative care. Whole body vibration has been shown to condition soft tissues, relieve sore muscles, accelerate healing and build bone density. 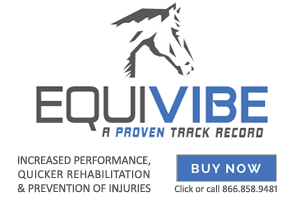 EquiVibe specifically offers vertical vibration, which mirrors natural movement and features customizable speed settings to meet each horse’s individual needs ranging from 10-60 hertz. EquiVibe is the top choice for vets, rehab centers & professional competitors. We love model 3072, which is sturdy enough for our large horses but portable for hauling. Learn about the many benefits of (vertical) whole body vibration and how to receive $500 OFF with code healthyhorse at EquiVibeTherapy.com. 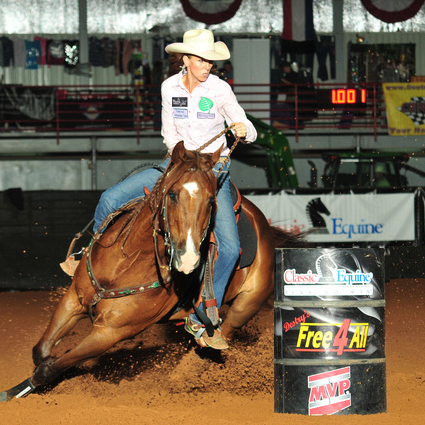 Competition is tough, and every barrel racer is looking for an edge – something to add to their program to produce that extra spark of vitality necessary to WIN. I’ve found however, that closely analyzing, simplifying and balancing our horse’s diet while utilizing natural forms of support to be an even more effective way of achieving optimal health & performance. Silver Lining offers the finest quality herbs, formulated for maximum absorption. They’re trusted by professional horsemen and the world’s most reputable veterinarians. To receive a 10% discount, visit SilverLiningHerbs.com and enter healthyhorse at checkout! You may be familiar with Acuscope and Myopulse systems used by sought-after equine therapists to keep barrel horses running strong. The cost of these bulky units and the training necessary to operate them can cost many thousands of dollars, but Matrix Therapy Products delivers the power of microcurrent therapy to every competitor and horse owner. The Best-Vet III therapy device features diagnostic capabilities, therapeutic functions, and has proven to be a game-changer for our horse’s health, soundness and performance! Click here to learn more, and HERE to invest in the one-of-a-kind Best-Vet III device. Our horses have benefitted from (hand-held) light therapy for several years. 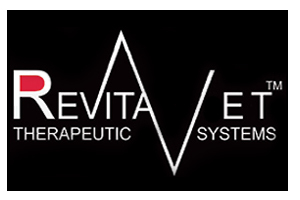 After investing in a RevitaVet system, we’re now achieving even greater results thanks to convenient accessories and wraps that penetrate even more deeply and cover much larger areas, such as the back, feet and legs. Infrared light therapy accelerates mitochondria within cells, increases ATP production and stimulates cellular regeneration. It releases endorphins, serotonin, and anti-inflammatory enzymes while suppressing those that create swelling and pain. Infrared light has been shown to increase lymph drainage, circulation, relax tight muscles, as well as improve the structure of tendons, bones, skin and cartilage by increasing collagen production. Working in partnership with like-minded professionals is something I embrace to truly create WIN/WIN/WIN opportunities. However, accepting sponsorship is not something I do without full and complete endorsement. As a longtime business owner who has successfully leveraged the internet through use of graphic & web design and copywriting, I’m well-prepared to offer sponsors an unprecedented degree of awareness and visibility for their business. Being a professional barrel racer, horsemanship instructor, coach, Licensed Veterinary Technician, 4x #1 best-selling author, plus having over 100,000 enthusiastic Facebook fans, over 10,000 Instagram followers, a significant email list growing steadily since 2011, and a history of over two million hits to BarrelRacingTips.com per month, as well as a deep, continually nurtured and trusting relationship with thousands of barrel racers worldwide – all demonstrates that I have effectively developed an incomparable skill set and unique platform from which to reach, and most importantly serve the barrel racing masses. I believe collaborating to build mutually beneficial relationships with other savvy business owners who share similar goals is also a vitally important for supporting continued growth of the barrel racing and rodeo industries as a whole. Together, we can work toward ensuring the western way of life and everything it represents is a legacy that lives on. 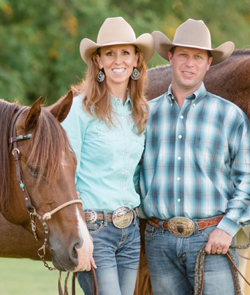 My passion andpurpose is delivering one-of-a-kind resources and inspiration to help barrel racers develop educated, confident, high-achieving equine athletes. If you feel as though your values and offerings align well with mine, please click here to get in touch via email regarding a potential partnership.